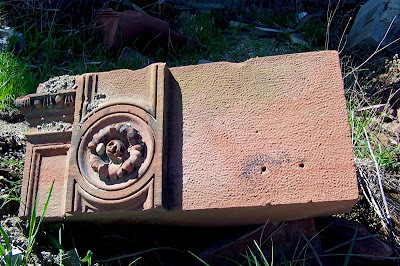 This past winter wasn't very kind to the William Livingstone House. Old Slumpy finally lost his face a few weeks ago. freakybuttrue captured the collapse of the facade. What was the imbecilic excuse for NOT setting this beautiful house on a FULL foundation after it was moved in the 1980's again? Sorry. I'm into historic preservation as much as anyone here and elsewhere and HATE it when awesome, well built architecture of just about ANY era is left to rot, but ol' Slumpy needs to be knocked down at this point. Imagine if that house wasn't fenced off and those students wandered a little closer just moments before the masonry started coming down - would they still be around? Thanks for the link. It's a shame what happened to that house, and the city let it happen. Granted it would have been paved over if it wasn't moved, but all of the work was done on the cheap. I think it will be gone by the end of the summer. Hopefully the stone work will be saved. Yeah, I remember reading a while ago (couple of years ago) on how this house was put under the ultimatum by, of all organizations, the Red Cross, to either move it or lose it back in 1983-1984 (? ), but I can't remember who owned it at that time. Has the city owned it since then, or did the owner move it and either ran out of $$$ or passed away and then the city took over ownership or what? Regardless, there's absolutely no excuse for letting this happen to what looked like a rock solid (and beautiful) house before the move. Detroit has, without a doubt, the biggest collection of awesome, turn-of-the-century (1890, 1900, 1910) dwellings I've seen yet and it's just APALLING how they've let so much of it just sit and rot when they were perfectly viable and solid, restorable houses and buildings when they were first vacated. Shoot, the fact that the Livingston house remained, for all intents and purposes, intact with roughly half a foundation for over 20 years is a testament in itself of how well built and strong it used to be. Demolition by neglect = sad and unexcuseable. Looks downright salvageable, doesn't it? That 2nd video is great! I added it to today's Slumpypalooza at Michigan in Pictures. 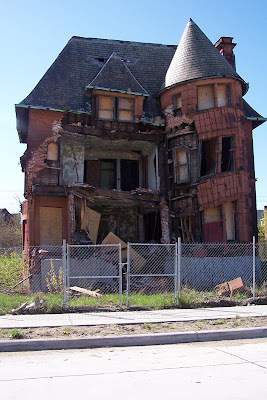 I think the house was part of those buy it for a dollar and fix it up deals. It pisses me off that the house was destroyed for a couple of parking spots. They managed to keep one house on the property why not this one? I love the architecture in Brush park and on Trumbull. BP has been my favorite area to shoot, and I'm want to document the area as much as possible. I'm allways looking for photos from it's past. I think it is slowly loosing its charm with all of the redevelopment, but I'm glad it's finally happening.